2018 was definitely the year of cascading bouquets for me! We’ve been seeing a bit of a resurgence of the cascade shape for a little while now, but with a looser, more garden style than the horrendous pointy triangle bouquets of the 80s and 90s. I thought I’d share a little about this style of bouquet in case it’s something that interests you! 1) To get the more organic, garden-inspired shape, these are handtied bouquets. In the past (and some older-school florists still do it this way), cascade bouquets were always designed in a bouquet holder. This is essentially a plastic handle that has a little cup at the end where a chunk of Oasis sits, for the flowers to be inserted into. I try to use Oasis/floral foam as little as humanly possible, as it’s terrible for the environment and is essentially plastic - and a carcinogenic! Yuck! I certainly don’t want you carrying around a bouquet that has the potential to make you sick. I also don’t think that the plastic holders are very comfortable to carry - they’ve always hurt my hands. I’d rather you hold onto the stems! 2) Because I don’t use a bouquet holder, it means that I need to use a LOT of stems to create the bouquet. So, not only is your bouquet going to be a little more expensive, it’s also likely to be pretty heavy. That might get a little annoying on the wedding day, but your biceps are going to look awesome in photos ;) Some florists will wire the flower heads to alleviate some of the weight, but with our super hot summers, I’m always a little worried that those flowers aren’t going to make it if they have no chance of being popped back into water throughout the day. 3) You’ll have to carry your bouquet slightly differently than you would with a traditional handtied bouquet. You can tell from some of these pictures that the bride’s hands are angled a little differently - the bouquet is in front of her like normal, but her hands are angled so the bouquet hangs down in front. I cut the stems as short as I can to allow for this to be as easy as possible for the bride, as you’ll want to hug the stems as close to your body as possible. This is really the one benefit of using a bouquet holder, as far as I’m concerned - the holder is designed to make it easy to design the bouquet’s shape, but the negatives outweigh that. So, angled hands you’ll have! 4) I have to be really specific about the flower and greenery types that I use. I like to use a few focal flowers, as I would normally, but then I’m also looking for stems that naturally have a vertical line or a curved line, to help create that cascade shape. And of course, vines and trailing greenery are a must to make the shape! Whatever your flower and decor budget is, I think one of the best uses of that money is through incorporating major focal points throughout your event design - and an easy one is your head table! Since everyone’s eyes will naturally flick to your head table or sweetheart table throughout the evening anyways, you might as well make it the centrepiece of the entire reception. An added benefit of creating a design focal point is that when one area stands out, you can scale back in other areas. So, if you’re working with a limited budget, adding more drama to your head table may allow you to cut back on the centrepieces. I’ve got some real cool head table designs in the works for 2019 weddings - can’t wait to show them off! Dream catchers, neon flowers, greenery accents…all sorts of great stuff. It’s never a bad idea to keep the design low to the table, as long as there is enough texture and movement throughout the entire piece. Whether it’s one centralized arrangement or several low but full floral arrangements spaced along the table, you make a major statement. I personally prefer more floral-heavy designs (obviously) but a greenery garland is a great way to go, too! There are multiple ways you could go about a floral backdrop - tall pieces behind you, individual hanging pieces or strands of flowers, or a full-on floral wall. Happy New Year, friends! I’m writing to you from my maternity leave :) I’ll still have fresh content coming to you every few weeks (don’t worry…I pre-scheduled it all before baby came so I’m not actually working that much right now!) - I just didn’t want to leave you hanging. I always love to start off the year with a post about the upcoming wedding trends that I see and really like. So all that to say, you can feel rest assured that when I write about the trends that I see, they’re more general style movements that will have lasting power and you’re not likely to regret choosing for one of the most important days of your life. I’m also mostly concerned about trends that play into your wedding flowers or overall event design. With that said, here are some of the “trends” that I am seeing a lot of, or would like to see more of, which I think would be a beautiful addition to your 2019 or 2020 wedding! This is hardly surprising. We’re moving into a slightly deeper, moodier take on the most popular tone of the last few years, blush. But like blush, mauve can be interpreted in more than one way. 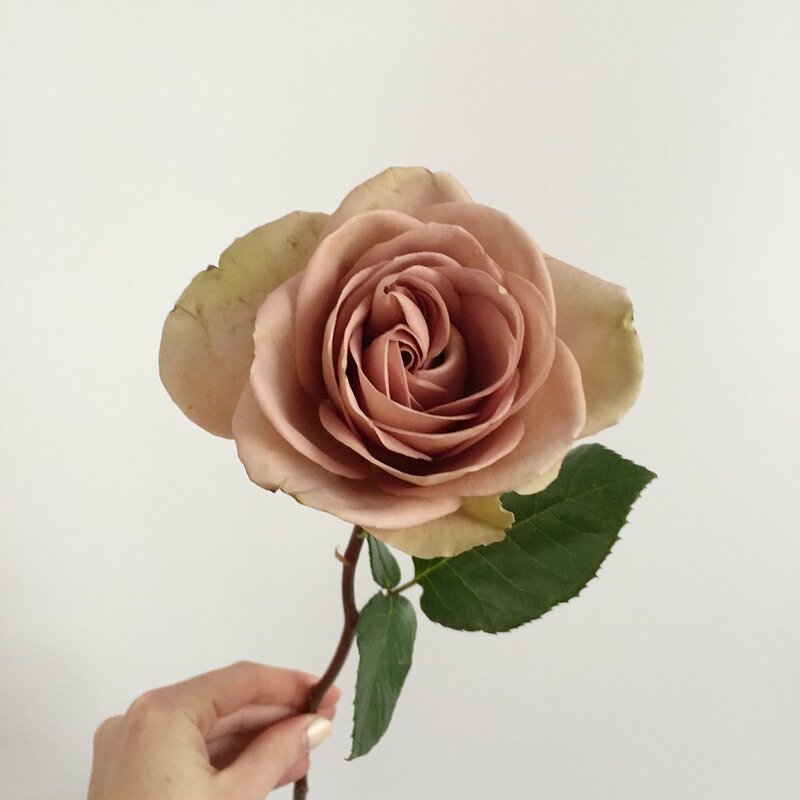 It can read pinkier, more purple/lavender, or more taupe-like depending on what direction you want to take it - I personally see mauve more as a muddy purple tone but I know a lot of florists who see it more pink. So, just be sure to have some picture or colour swatch representation to make sure that all of your aesthetic wedding vendors are on the same page when it comes to understanding your wishes for mauve. Mauve pairs well with an analogous colour palette, which means a grouping of 3 colours that sit right beside each on the colour wheel. So, shades of pinks, purples, and peaches, as an example, would allow mauve to be the perfect base colour. Honourable Mention for Colour of the Year: Orange! Yes, I’m surprising myself when I say this, seeing as orange has always been right at the bottom of my list. But, I’m seeing more and more of it being tucked in as an accent colour to weddings, bringing a shot of vibrancy that many of my couples seem to be craving. Even more surprising, I’m finding that I don’t hate it…but actually kind of like it! Take a look at the Marchesa gown below, shot by KT Merry for Flutter Mag - orange is not the primary colour by any stretch of the imagination, but it plays a supporting role that awakens the other tones mixed throughout the gown. I have a wedding coming up this year with a similar palette that I CANNOT wait for! I personally like to see orange used as an accent, as I often find it too aggressive as a focal colour. It pairs beautifully with blue, red, yellow, green, and anything in the peaches to coral range. If you follow any large-name floral and wedding designers on Instagram, I’m confident that you’ll have noticed one of the more recent trends that I’m saying you can’t miss: a touch of the tropics. I’m talking a dramatic usage of large palm leaves, ferns (both natural and bleached), and tropical flowers like anthuriums or orchids. 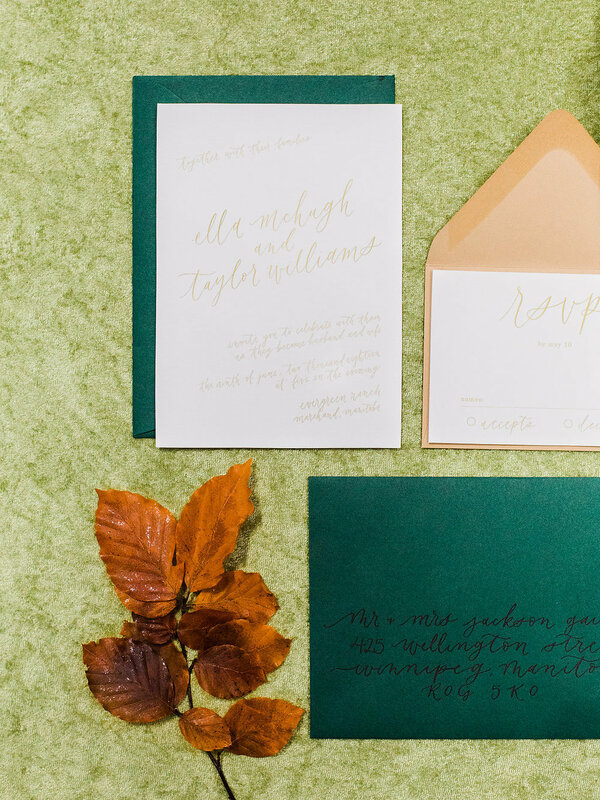 Now, you don’t need to go all the way with a rainforest-inspired wedding (though I’m definitely not knocking that!) and you can easily work a tropical accent into a garden-inspired design. 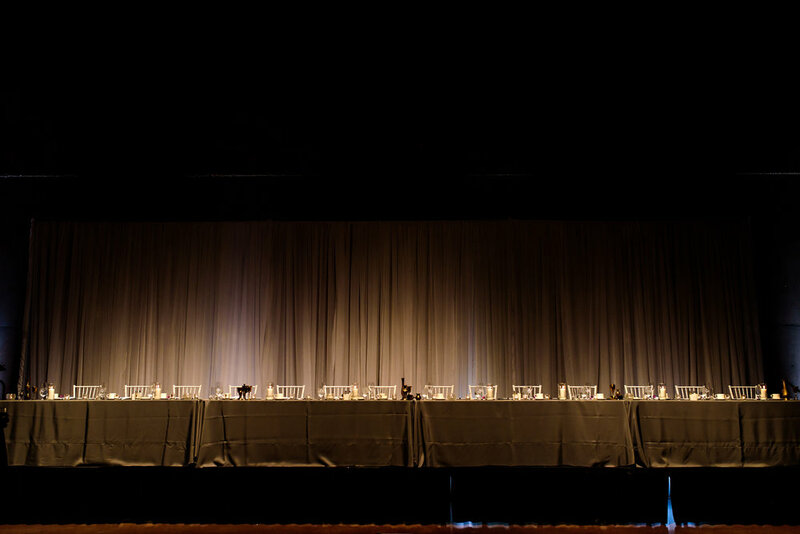 What’s Trending in Table Decor? Floral Centrepieces! I’m pretty pleased to see a return to more floral-heavy centrepieces in the coming year. I’m seeing fewer and fewer requests for garlands, which I have to say I’m happy about - as much as garlands are gorgeous, they get pretty repetitive for us florists. My clients are typically asking for arrangements that are low to the table, as opposed to tall ones, and sometimes asking for styles in which you can’t even see the vase. Of course, just be prepared that a floral arrangement will have a price tag on it. I typically suggest a minimum of $75 for a floral centrepiece, with most of the inspiration photos that people are bringing me from Pinterest coming in around $300 each (generally I find a $125 - $175 budget to be PERFECT). 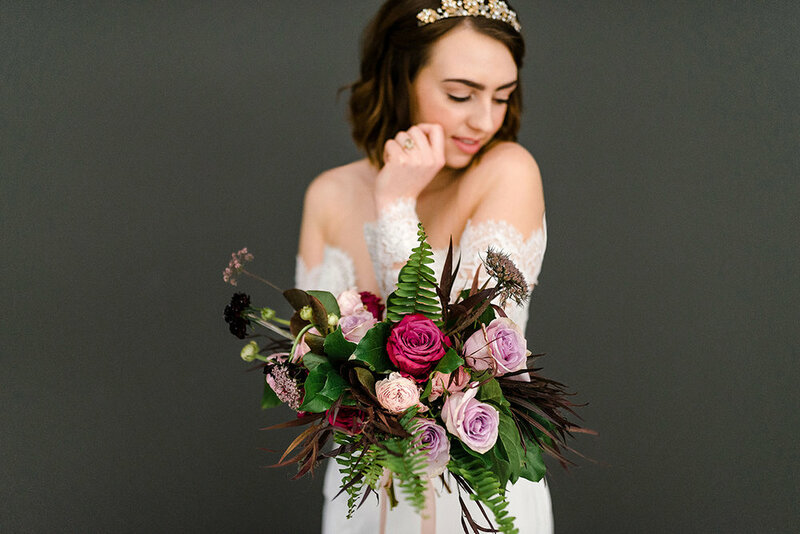 Photo by Laura Foote Photography, Florals by me! I’d love to see more of my clients adding depth to their tablescapes with the use of coloured candles. A subtle taupe elevates the sense of elegance in a space, a petal pink emphasizes femininity, a warm toffee adds richness, a charcoal grey feels chic and big-city. See what I mean? So much depth can be brought to your overall reception design with the simple tweak that is a coloured candle. These are always going to be more expensive than your typical white candle, but I think it’s a worthwhile investment. Some of my favourite sources for coloured candles are Yummi (which is a Canadian brand, and in my opinion, the best! ), Creative Candles, and Quick Candles. The set below is from The Floral Society (they recently started selling at Anthropologie!) and I LOVE them! There are a lot of awesome options for gorgeous wedding venues within a half hour or so drive of Winnipeg…but most of those require a few more logistics than the convenience of a city wedding (you can find my top 5 best wedding venues in Manitoba here!). But, most of the wedding venue options within Winnipeg are hotel ballrooms - and while there’s nothing wrong with a hotel ballroom, I find that most of my clients are looking for something that’s a bit more interesting and less “ballroom.” So, here’s a roundup of my Top 5 Favourite Unique Wedding Venues in downtown Winnipeg! First of all, I LOVE restaurant weddings - and SMITH is at the top of my list. Located on the main floor of the Inn at the Forks and recently renovated, it’s a really gorgeous and unique option for a wedding. 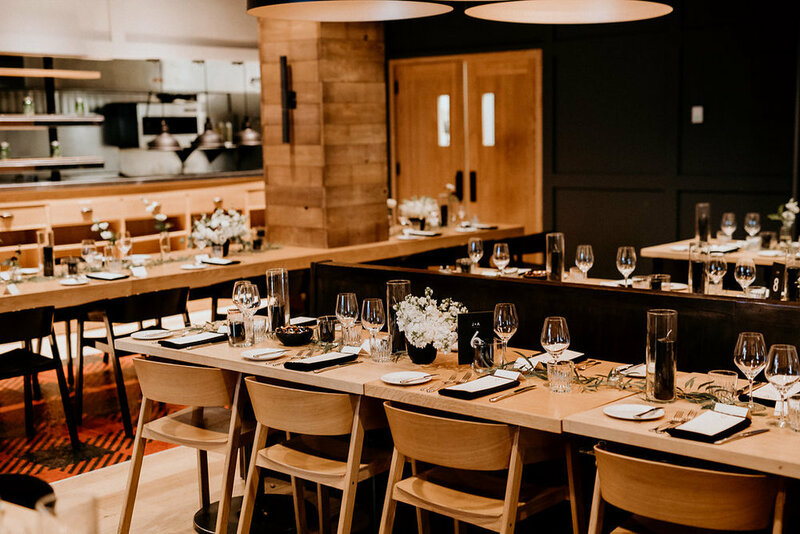 I love the idea of seating your guests throughout the restaurant, and if you haven’t eaten there before, the menu is PHENOMENAL. If you have a smaller guest list, you can seat all of your guests in the main space, but there’s also a large solarium, and the lounge typically doubles as the dance floor area. I LOVE Eckhardt Hall, on the main floor at the Winnipeg Art Gallery. It’s not a new space or a hidden treasure by any means, but that doesn’t stop me from loving it. It’s just such a cool venue! Your guests will walk into the WAG and enter right into Eckhardt Hall. The natural stone floors and walls are neutral and have a lot of Manitoba character, the ceilings are incredibly high, and you might get lucky with a very cool art installation or paintings hung on the walls. I also love their rooftop, which is such a great place for your wedding ceremony, cocktail hour, etc. View this entire, colourful wedding here! 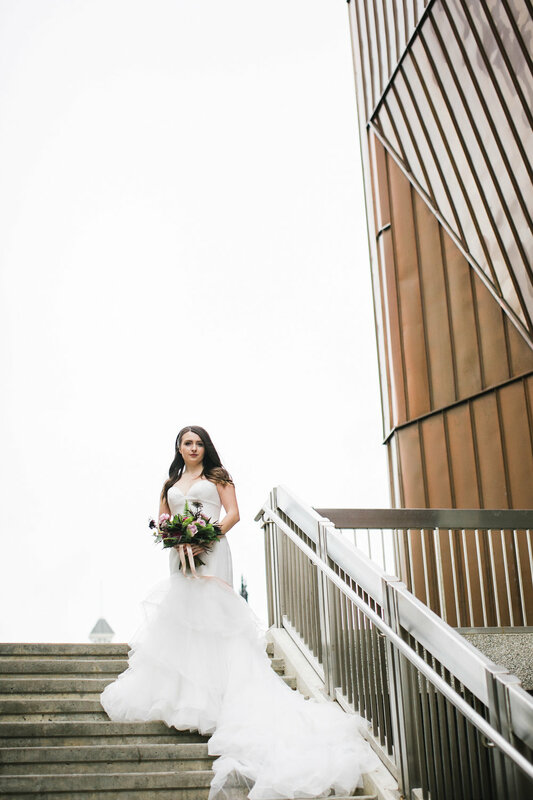 | For another look at weddings at the WAG, check out this modern rooftop wedding! Hut K is technically a furniture store, but they have a gallery space at the back that can be rented for smaller weddings and events - and it’s pretty cool! It lacks some of the amenities of a traditional wedding venue, so I recommend hiring at least a day-of wedding coordinator if you book your wedding here, but it makes up for this with style factor. White walls, open ceilings (AKA your florist can have fun with hanging floral installations! ), and a long, rectangular shape make this a really unique space. You can’t seat a massive amount of people (I think it’s around 100 for a comfortably seated dinner) but if you’re going for a cocktail style reception, you can host up to 200 people. -it fits a LOT of people - up to 600! It’s nothing new to say that the Human Rights Museum is a great place for a wedding, and I suppose because it’s been popular for a few years now, it may not exactly be considered “unique.” But what I love is the different spaces that are available that you may not have thought of before. Buhler Hall is where most people host their receptions - it fits a lot of people well, but it’s really dark. There are, however, other spaces - I’m particularly excited for a wedding next summer where the reception is being held in the Garden of Contemplation (where a lot of couples will host their ceremonies). It’s open and airy, with beautiful light and is just a really unique setting. 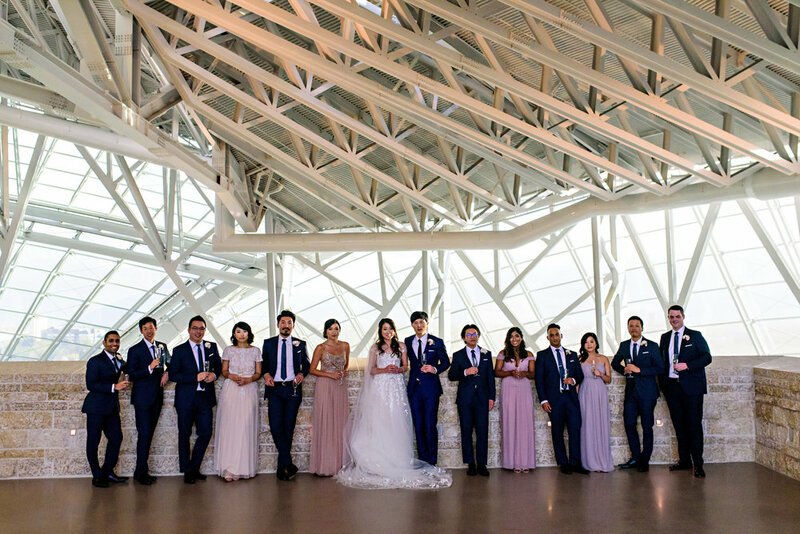 Check out another Human Rights Museum wedding here! Okay, I know the whole point of this post was to highlight unique, non-hotel wedding venues in downtown Winnipeg, and the Hotel Fort Garry has been hosting weddings in their ballrooms for over 100 years already. BUT it’s still one of my favourite wedding venues in downtown Winnipeg, and in particular, the Provencher Room (seen above). If you want your wedding to feel classic and elegant, there’s no better option for you. The benefits of being able to get ready in one of their suites, visit the spa, and simplify your out-of-town guests’ stay are obvious as well! See more from this gorgeous, flower-filled wedding here! I also did a wedding reception this fall at the Kingshead Pub! They have SUCH delish food and a cool atmosphere, so if you’re looking for something more laid-back with a hangout type of vibe, this could be a really good option for you. For this wedding, the entire second floor was rented (so you would have your own bar, your own bathrooms, your own dancefloor, etc) and then it opened to the general public around midnight. I am a HUGE believer in community over competition. The wedding industry is an interesting one because we all create so much - and that can make it very competitive and judgemental ("will that couple book with me or with them? This thing that I just made is total crap. This thing I just made is incredible and no one will ever beat it."). It can be hard to find the balance between viewing the other people in your industry as colleagues versus competitors. So, for the last two years, one thing that I've really enjoyed putting together is a Styled Shoot day for a handful of wedding planners in the city. My goals are primarily to have fun (they have stressful jobs! ), fostering community, creating connections, and building portfolios. But, I do it a little differently than other styled shoots which are usually planned down to the last detail. I do it as a surprise for them! I usually give them the overall colour palette, and that's it. When they show up on the day, they'll find tables full of options that they can pull from to create a look that they love. This includes dresses and accessories for their models, plenty of vase options for centrepieces, flatware and dishes, linens, chairs, stationery, and so on! Here's a little behind the scenes from that day! It's pretty different than the behind the scenes for a wedding day, but it's still fun! A HUGE thanks to everyone who took part! Tell you what, guys: designing on site with a limited amount of ingredients for a lineup of wedding planners is a little tricky (as you can see from that first pic! ha!). We also had an amazing crew of photographers who volunteered their time and were each partnered with a planner. Below are some images from a demo table that I put together, photographed by Esther Funk Photography. With the warm fall tones in the flowers I thought the light blue linen would be a nice contrast. I was planning to do something completely differently, but I love how it turned out! And now for the finished design! Below are some of the details from the tables that each of the planners put together! This feminine, pretty table was designed by Ashley at Ashley Brooke Weddings. She's a girly girl so I wasn't surprised when she chose a feminine palette. I love the gold accents and that deep hit of plum. And I love that photographer Aimee de la Lande chose that black wall to take photos in front of. Wooo! Up next is Sheila from Inspired Elegance Events! It was funny to chat with her while she was putting this together. Her only thought coming into the shoot day (knowing that there was nothing she could do to prepare) was "I'm not going to do pink." ha! I liked this take on pink. Instead of the light, airy blush that has been going around for a few years (and let's be honest, is always beautiful), she added some serious depth with those dark wood crossback chairs and berry toned flowers. I also loved that she chose to go with a tall arrangement. I'm not usually a huge fan of tall centrepieces, but sometimes and in some spaces, tall arrangements are perfect. This design was put together by Amanda Douglas Events. I like that it really plays off of natural tones as the base, and then layers in some of that brighter, richer warm tones. Those wood charger plates are such an awesome texture that's added in, and Amanda tucked in a few of her own details - the candles and black plates. And finally, we've got a newer planner: Ashley from White Ivy Weddings. Her favourite element from everything that was available to choose from was the rich, warm orange copper beech leaves, and she built her entire design around them. I LOVE the orange ranunculus paired with those golden mustard roses, the addition of the burgundy taper candles, and the warm brass coloured linen.